In order to be dubbed one of the greatest, a stamp needs to meet one or more of the following criteria: visually stunning; historically signifi cant; interesting philatelic history; recognizable to those outside the hobby. The subjects of this installment are all railroad bonds with the revenue stamps imprinted directly on the bonds. Three of the four have an interesting story to tell. 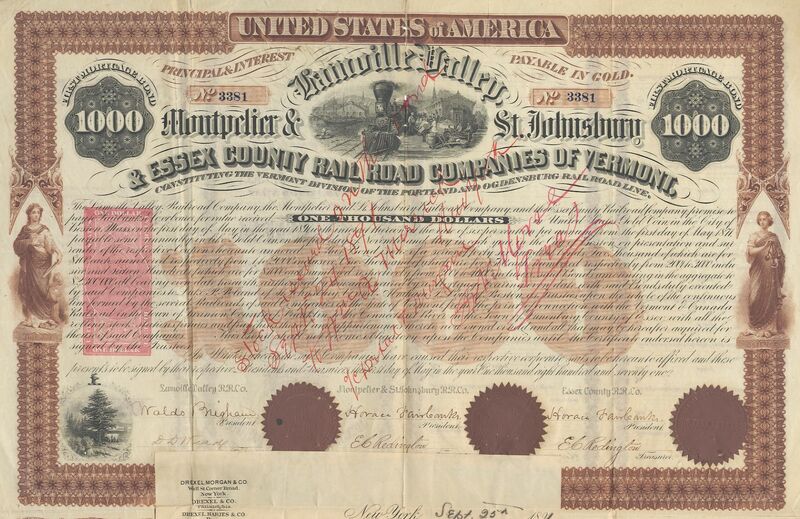 We begin with a modern find of railroad bonds from the Lemoille Valley, Montpelier & St. Johnsbury, & Essex County Rail Road Company of Vermont. The astute reader will note the spelling of the fi rst word “Lemoille,” which appears that way on the bonds themselves will appear as “Lamoille” below. The reason for this is not entirely clear, but the spelling with the “a” was how the name appears later all the way to the present. That aside, the name on the bonds with all three railroad names included is quite a mouthful. The reason that it is a mouthful is that these bonds were issued as part of the merger of three rail roads that apparently did not wish to give up any of their individual identities. Ironically, their identity was quickly lost as the three formed the Vermont Division of the Portland (ME) and Ogdensburg (NY) Railroad four years later in 1875. One might muse that the long name with all three railroads included might have been too expensive to put on all their stationery and the rolling stock! The Essex County Railroad was chartered in 1864 to run from St. Johnsbury, Vermont, on the Connecticut and Passumpsic Rivers Railroad, east to Lunenburg on the border with New Hampshire. The Montpelier and St. Johnsbury Railroad was chartered in 1866 to run west from St. Johnsbury to Montpelier. In 1867 the Lamoille Valley Railroad was chartered in 1867 to run from West Danville on the planned Montpelier &St. Johnsbury northwest to Swanton. Construction on the Vermont Division began in 1871, and was completed in 1877. So it would appear that the bonds that are about to be described were issued to raise the funds to build the railroad across most of Vermont. The original find of these bonds was rich, if not large. First it contained fi ve examples of the $100 bond, imprinted with the heretofore unknown type R stamp in brown (Scott RN-R1). Examples of the 10¢ type R, regardless of color, are difficult to find in and of themselves, but a new color was a signifi cant fi nd. In general examples of $100 bonds are also relatively unusual. The financing of the railroads in the nineteenth century was primarily with $1000 bonds. Only in cases where the sale of the bonds slowed did the railroads resort to $500 bonds to attract less wealthy investors, and only very occasionally did they issue $100 bonds. So this bond is quite unusual from a fi scal history point of view. 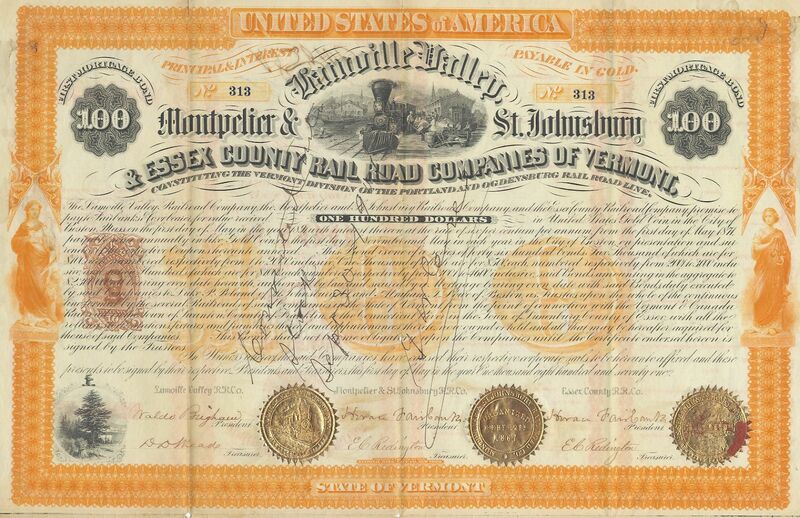 Although there were also $500 bonds as part of the find which were imprinted with either a brown (RN-V2) or orange (RN-V4) 50¢ stamp, we will skip ahead to another great item that was find among the bonds of the Lemoille Valley, Montpelier & St. Johnsbury, & Essex County Rail Road Company of Vermont. Although there were $1000 bonds found imprinted with the orange RN-W2, two of the $1000 bonds also were found imprinted with a pink $1 stamp (Scott RN-W6).Although the history of these three railroads and their merger is very brief (before they lost their identity in the Vermont Division of the Portland and Ogdensburg Railroad), the bonds are a rich philatelic episode. That both the $500 and $1000 bonds are known with different color imprint stamps suggests that the management of the company was operating on a very limited budget. The different colors suggests that these bonds were imprinted in different printings, possibly both in 1871. In any case, all of the bonds were not sent at the same time to the American Phototype Company in New York for imprinting. The story of the New Jersey Midland Railway Company and the raising of funds for the construction of the 68 mile railroad from Figure 2. RN-W6 Lemoille Jersey City to Unionville, New York (at the state line) is also philatelically interesting. Like most railroads seeking to raise funds they issued $1000 face value bonds to finance their fi rst mortgage. These are dated August 1, 1870. 10¢ stamp (Scott RN-S1) to pay the tax on mortgages at the rate of 10¢ per $100 and a 5¢ stamp (Scott RN-Q1) that pays for the trustees certifi cation on the bond. Neither the type S nor the type Q imprints are believed to have come into use before early 1872, so it seems likely that these second mortgage bonds did not come into use until that time. By 1875 the railroad had gone into receivership and in July the bond holders were meeting to oppose the reorganization plan in which new money lenders would receive priority over the bond holders. 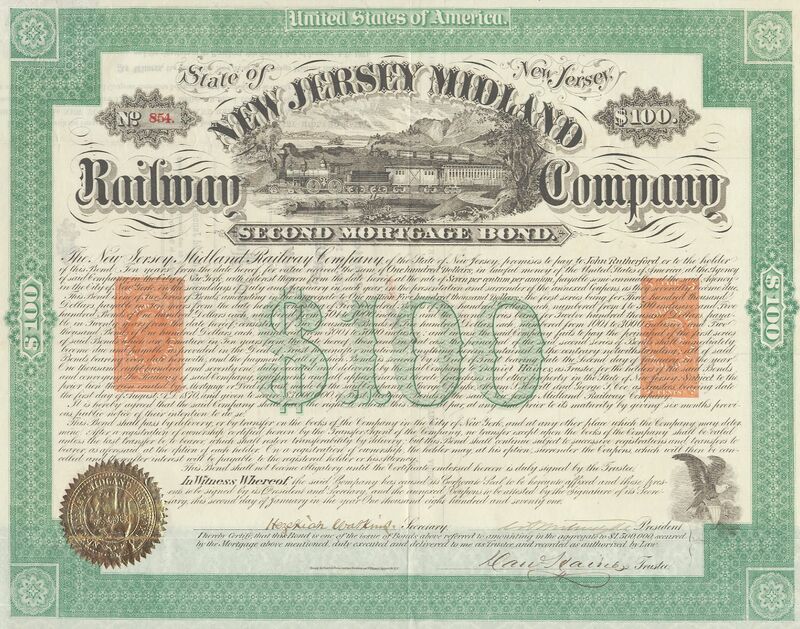 Only five copies of the New Jersey Midland $100 bonds are currently recorded in collectors’ hands. The story of the Dubuque & Sioux City Rail Road bonds is also quite fascinating from a philatelic point of view. Two denominations of bonds, $500 and $1000, were printed by Henry Seibert & Brothers in 1867. They were then forwarded to the American Phototype Company for imprinting. They were initially imprinted with 50¢ and $1.00 stamps, the rate that one would expect if these were mortgage bonds. But that was not the case. These were almost a simple promise to pay with no pledge of the property and rolling stock of the company pledged as collateral for the bonds. These were what we would today call junk bonds, or nearly so. The Dubuque & Sioux City Rail Road pledged to set aside $18,000 per year in two installments and placed in a sinking fund. These were also convertible into stock of the same rail road. The advantage for the investor was that if the company was fi nancially successful and the stock of the company appreciated in value, these bonds could be used to purchase an ownership share of the company. At what point it was discovered that these bonds were improperly stamped is not known. The fact that they are dated May 1, 1867 suggests that they may have been imprinted by the American Phototype Company before it was required that all new imprinting work had to be approved by the Bureau of Internal Revenue in Washington (April 15, 1867). Unsecured debt was to be taxed as a promissory note, i.e., at the rate of 5¢ per $100 of face value. Thus they should have been taxed at 25¢ and 50¢ respectively. 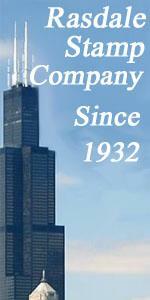 The agreement that they could be converted at any time into stock of the company required an additional tax of 5¢. The $500 bond thus was imprinted with a 25¢ stamp and a 5¢ stamp in green obliterating the original 50¢ orange imprinted stamp; similarly the $1000 bond was imprinted with 50¢ and 5¢ stamps in green obliterating the underlying $1.00 imprint. The Dubuque & Sioux City Rail Road bonds are the only ones known to the author that show evidence that an error in imprinting had been caught and subsequently corrected. They are the only examples of the higher denominations that were printed in green. The $500 bonds are quite scarce, only 6 copies having been recorded in collections. 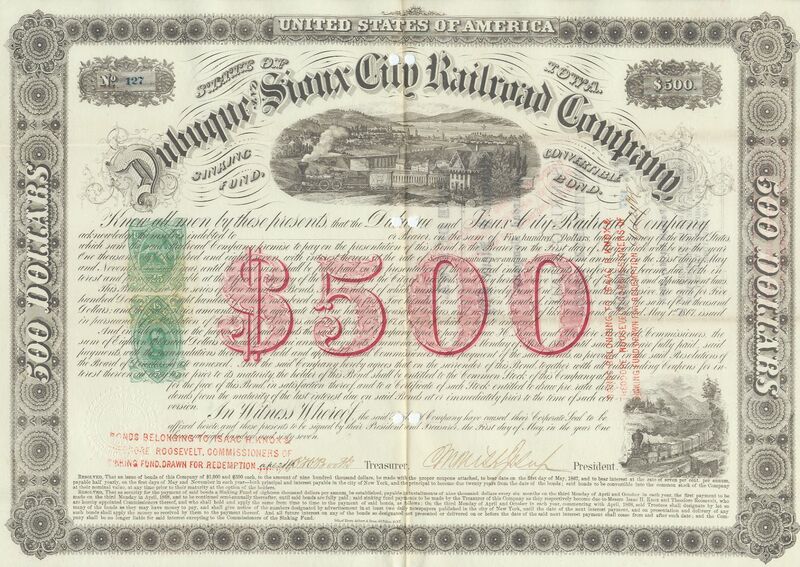 The provenance of the Dubuque & Sioux City Rail Road bonds is also quite interesting. Two of the bonds were in the estate sale of the collection of the late Samuel Smith (Ivy & Mader, December 11-12, 2001), who certainly deserves the credit for resurrecting the collecting and study of revenue stamped paper for his series of articles on stamped paper that appeared in The Bureau Specialist and later in The American Revenuer in the early and mid-1970’s. that all six of the currently known examples originated in the Deats collection that was at one point in the stock of the Philadelphia dealer Phillip Ward, before passing to the Weill brothers. of these great items were at one time represented in the collection of the late Bill Buford, who formed the most comprehensive collection of Civil War era revenue stamped paper that has ever been assembled. We owe him a debt of gratitude.